A social investment bank is the Conservative Party's top priority for the third sector, according to party leader David Cameron. 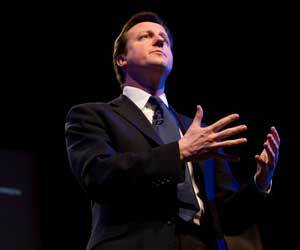 Cameron made the promise yesterday in his keynote speech at Voice09, a social enterprise conference in Birmingham. He said he saw a social investment bank as essential for the sector; it would be a one-stop shop not only for investment but also to provide financial advice to social entrepreneurs. "It's fair to say that the whole social enterprise sector is undercapitalised," he said. "A social investment bank would address that problem." The Government has said it will consider developing a £250m social investment bank, which would act as a wholesale supplier of capital to other social lenders, with funds released from unused bank accounts under the Dormant Bank and Building Society Act, which came into effect late last year. However, it has said it is a third priority, behind measures to improve youth involvement and tackle financial exclusion, and will only be developed if the act yields enough cash. Cameron said that a social stock exchange, where equity in social enterprises could be traded, was an interesting idea and one the Conservative Party would be interested in looking into. He said he was interested in handing over more responsibility to social enterprises to solve local problems. "We want to end top-down state intervention as the answer to everything," he said. "It isn't working and in my view it will never work." He said he wanted to take power away from government and instead offer incentives to individuals and communities to solve their own problems.